State of the art subwoofer offers particularly good transient response, which means extra weight and acoustic characterisation of good recordings without bloat or overhang,and good integration with host systems. Good depth and particularly good transient response and release, readily adjustable, amplifier/interface upgradeable. We would have liked a mains power switch on electronics, the top surface could become a dust trap, and it's not the most decorative of hi-fi to get past the 'domestic manager'. The Torus has been around in one form or another for a while. We first saw a prototype the Spring before last at the High End show in Frankfurt. It is a subwoofer (Wilson Benesch calls it something more grandiose, and we'll get back to that point soon) like no other you have seen before - or since. Among many superlatives, it is surely the most eye-turning subwoofer ever, inhabiting a reasonably compact, but clearly potent heavyweight enclosure. It is passively driven, and typically comes with a matching 200W monaural amplifier/low pass filter unit/ interface box, about the size of a conventional integrated amplifier. The two are available separately, and in principal, at least, if you find an alternative suitably specified electronics package, you could use that instead. As a combination, the Torus 'infrasonic generator' (Wilson Benesch's terminology) and amplifier are functionally the same as a standard subwoofer, though it could hardly be described as conventional, as there is no formal drive unit involved. Instead, there is a large-area diaphragm, made from immensely strong but light carbon fibre, driven by two 82mm voice coils, working in push-pull to create an intrinsic restoring force. Normally, a driver's suspension would do the same job, but with a time delay, due to the mechanical hysteresis involved. The push-pull voice coil also results in a cancellation of third order distortion products. Instead of a combination of driver basket and enclosure, the reaction force from the diaphragm travels through a massive component called 'The Core'; a two-part 16kg central rod which is rigidly coupled to a steel baseplate and then to ground, which acts as a mechanical, essentially compliance-free earth. This major component is also used to conduct heat away, assisted by a Boron Nitride coating. The outer structure of the Torus is there simply to provide air sealing around the diaphragm. How the Torus components have been arrived at is not easy to nail down, because Wilson Benesch's claims are couched in generalities. Moreover, in the instruction manual, it attributes the role of 'architect of subwoofers' to REL's Richard Lord, where in fact much of the early pioneering work was attributable to Karl-Erik Stahl back in the late 1970s. His ACE-Bass technology - applied to the Audio Pro subwoofer range - specifically addressed key problems facing subwoofer designers, long before REL was formed. Wilson Benesch also ignores the recent trend to decoupling subwoofer enclosures from their drive units, and the use of multiple opposed drivers (which is part of the solution to the problem identified by Wilson Benesch), for example by Mordaunt-Short and Eclipse. However, Wilson Benesch does point out that although a large-area drive unit is needed to move enough air for serious bass, a large drive unit cannot accelerate and decelerate the diaphragm efficiently enough to be successfully integrated with satellite speakers. An early solution to this problem, the Isobaric Tactic, was developed with SMART (government) funding about eight years ago. The new Torus driver is a more practical clean-sheet design, which is claimed to be a more efficient and readily built solution, than was available before. 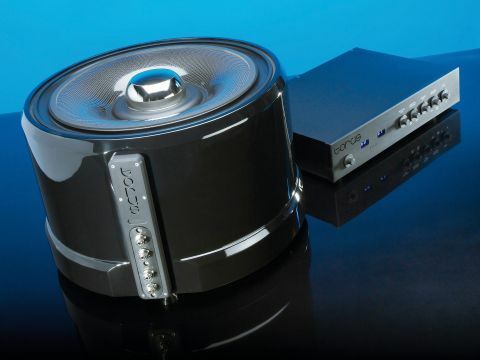 The matching Torus amplifier has two inputs, one at 'high' level, for use with preamp outputs in a stereo system, or via a REL-like Neutrik Speakon balanced connector, with bare wire to connect to the speaker outputs of a power amp, or integrated in parallel with the main stereo pair. This takes care of low frequency programme content. Alternatively, it can be driven at low level from a preamp output or the LFE output of a multichannel AV amplifier, primarily for special effects. Both inputs can be wired simultaneously, and the system adjusted to provide a combination of low frequency support for stereo and LFE output - similar to the generic pattern from REL (and some other) subwoofers, in fact. Each input has its own independently adjustable low pass filter and gain control. A DIL switch fitted to the base, sets the overall high pass or bypass settings: a one-time adjustment. The front panel controls (and display) provide everyday low pass fine adjustment. It took some time to get a measure of the performance of the Torus, which was eventually tackled by using it with a range of speakers of different size and intrinsic bandwidth. At the two extremes, we used the ALR Jordan Classic 1, which is almost small enough to stand in the palm of your hand and the Triangle Magellan Concerto SW2, that would crush the same hand paper-thin given half a chance (both speakers are reviewed elsewhere in this issue). The ALR was too small. The Torus added a satisfying extension to the diminutive satellite, but the added bass simply wasn't in character, and at the necessarily high crossover point chosen, it was obvious that there was a discontinuity, and where it was. But, this is not unusual with subwoofers; it seems to be one of the key ironies that the satellites which benefit most from subwoofer reinforcement, are those that need the subwoofer the least; they are relatively large (or at least, not too small) and can be used with a crossover frequency below, say, 40Hz. The Triangle is a fish of an entirely different colour of course. It works well with the Torus filter set to roll the subwoofer in at around 30Hz. This turns out to be the lowest available setting. On balance, and at the risk of sounding pedantic, it would be good if there were a lower setting on tap. As long as the sub was set at a discreet level, the bass reinforcement was palpable, and yet the subwoofer was virtually inaudible in its own right, which is exactly how a subwoofer should be - felt but not heard. It was at its best with live recordings, with a natural acoustic content below the frequency range of most musical fundamentals. Here, the Torus added structure to the sound, indicating the presence and nature of the recording venue - the size and approximate shape of the concert hall for example. It was easy to achieve a seamless combination with the satellites, where the crossover frequency was low enough, and the subwoofer was able to add colour and shape to the sound of certain instruments. For example, in a recording of Saint-Saens' Organ symphony (on Pentatone), the Torus added colour and stature to the orchestral organ, while (and this is the important point) leaving the main pickup from the orchestra practically unaltered. The result was a sound with much greater internal contrasts and dynamic shadings. This was simply much more exciting and colourful to listen to. Generally, the Torus added character, atmosphere and weight, and it was clearly much faster at producing and releasing notes than most subs. It has a genuine grip on the bass that brings out the architectural qualities of each recording. As such, it was able to restore a natural sense of structure to the music whilst avoiding any bloom or excess. Wilson Benesch doesn't classify the Torus as a subwoofer, but as an infra-bass generator. In our view, the distinction is largely semantic. After all, if it walks like a subwoofer and talks like a subwoofer, there is only one conclusion to be drawn, and even Wilson Benesch only claims that the Torus does it better, not that it does something fundamentally different. It is a fine subwoofer, not necessarily better than the best available, though it is certainly in that ballpark. The only real disadvantages are a relatively limited maximum acoustic output (probably not an issue except under exceptional circumstances) and a high selling price, though even this is fully justifiable given the materials used and the build quality involved, both of which are exceptional.